I love reading as much as I love crafting, so today I have a set of bookmarks to share with you. I wanted something nostalgic, so I decided to use canvas and paint along with stamps and inks. This is how I made them. 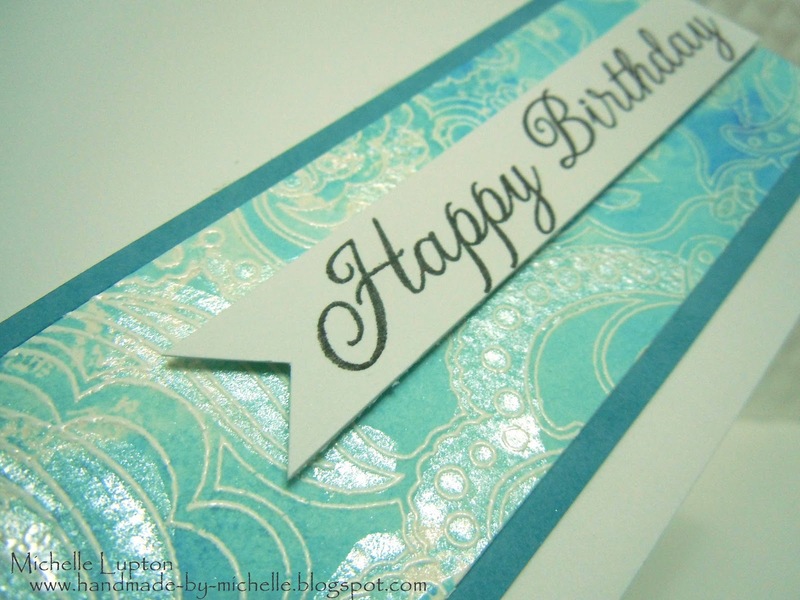 – I adhered the canvas on heavy cardstock and die cut the bookmark shapes. – I colored them with acrylic paint (Distress pain). 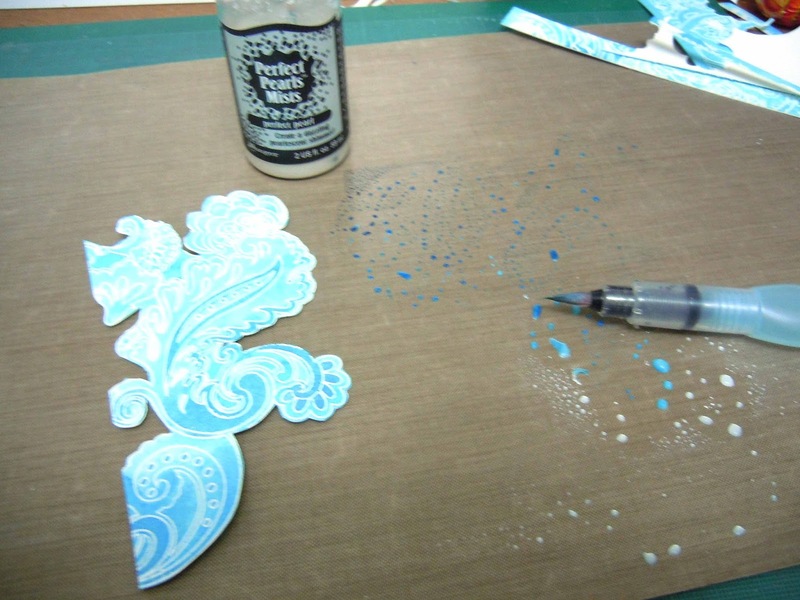 – Once they were dry I stamped the script image using the Distress inks and the flourish image with white acrylic paint. I also distressed the edges with the white paint. – I stamped the flowers on canvas,die cut them and adhered them on bookmarks. 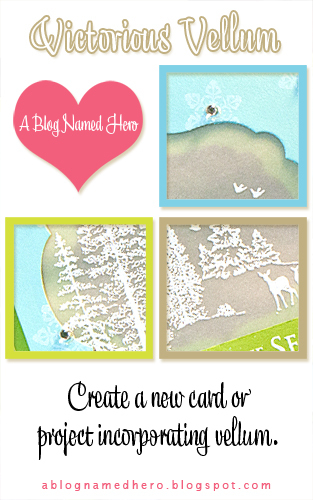 – If the back side gets to messy, adhere another cardstock die cut. In case you missed it… there are two more days to join our current challenge. One lucky winner will recieve the $25 gift certificate from our generous sponsor Simon Says Stamp. Thanks for stopping by, I am sending you nicest wishes from Slovenia. Hi, everyone! 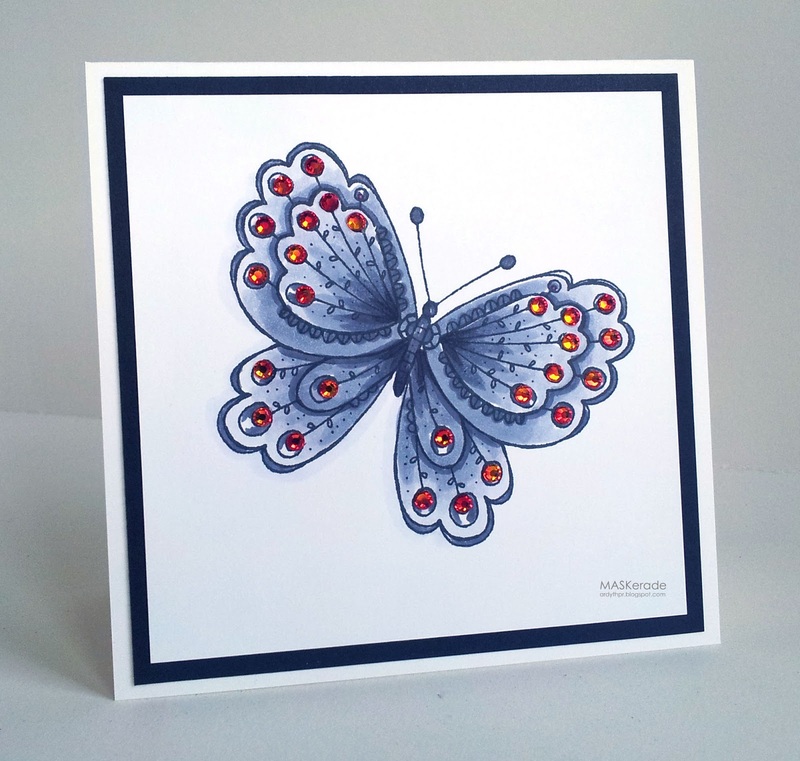 Michelle Lupton back again as a guest designer, this time covering for Michelle Liimatainen. I love my background stamps. I have quite a few (but you can never have enough, right!? ), but there are a couple that I just keep coming back to. 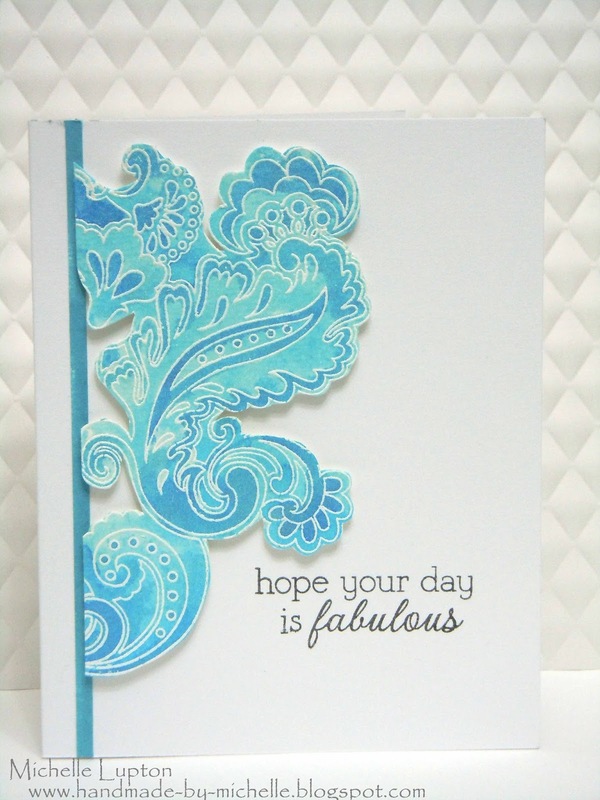 “Flower dot pattern” is one of the ones I just adore – it is by Hero Arts and Basic Grey. 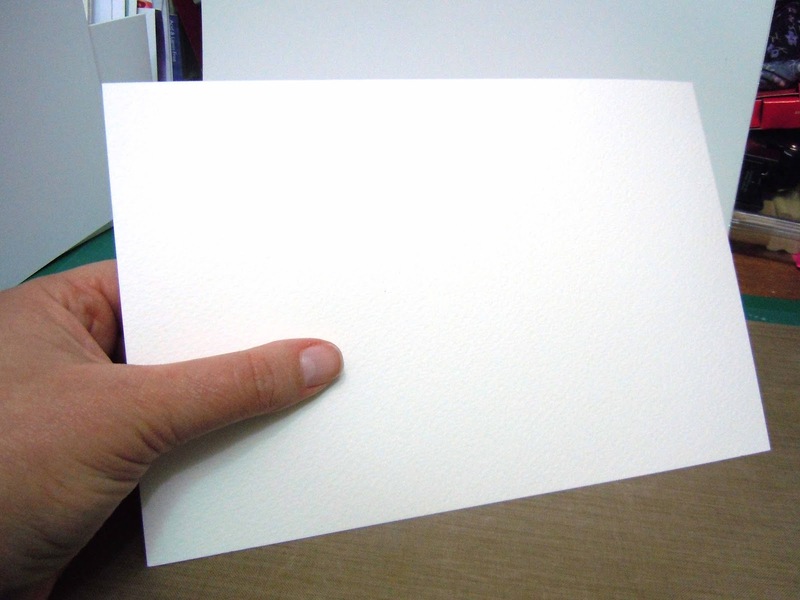 I thought I’d start with a piece of watercolour paper (half US letter size) and see what I could come up with. 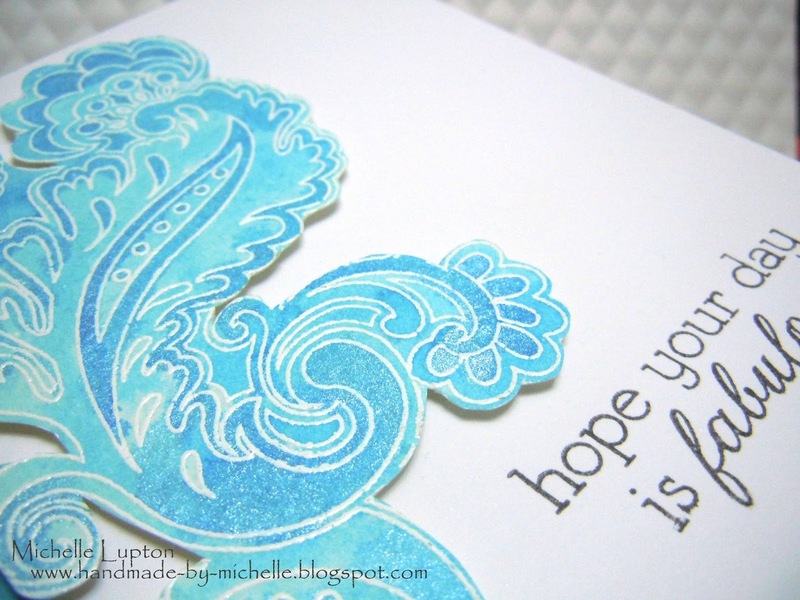 The starting point – some Stampin’ Up watercolour paper. 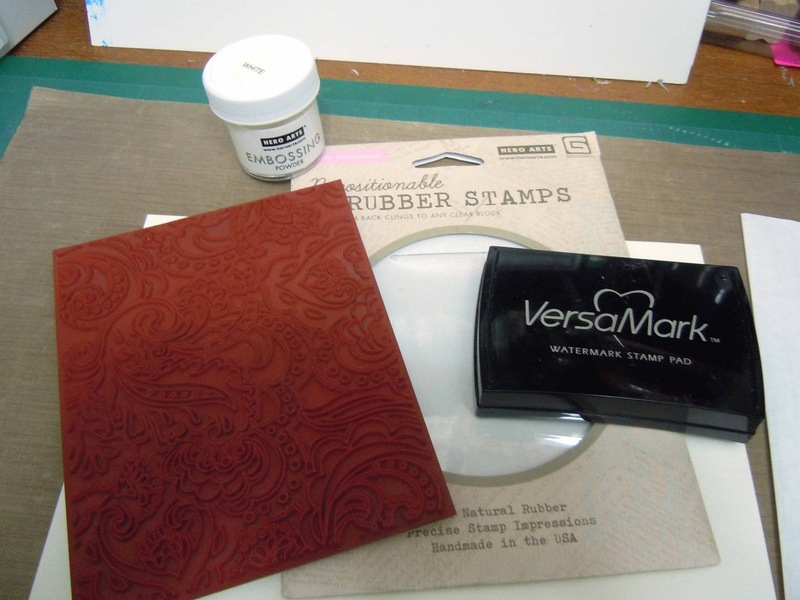 The tools – stamp, Versamark ink, Hero Arts embossing powder (and 3 distress inks – colours are in the Inlinkz list below). 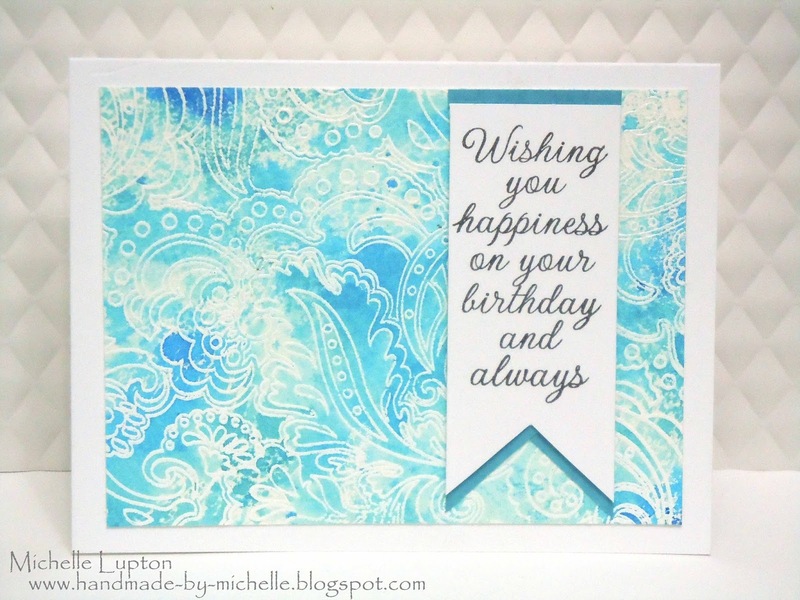 I heat embossed the stamped image in white, then I put some Distress Inks onto my craft mat, spritzed with water and dunked the paper into the ink. 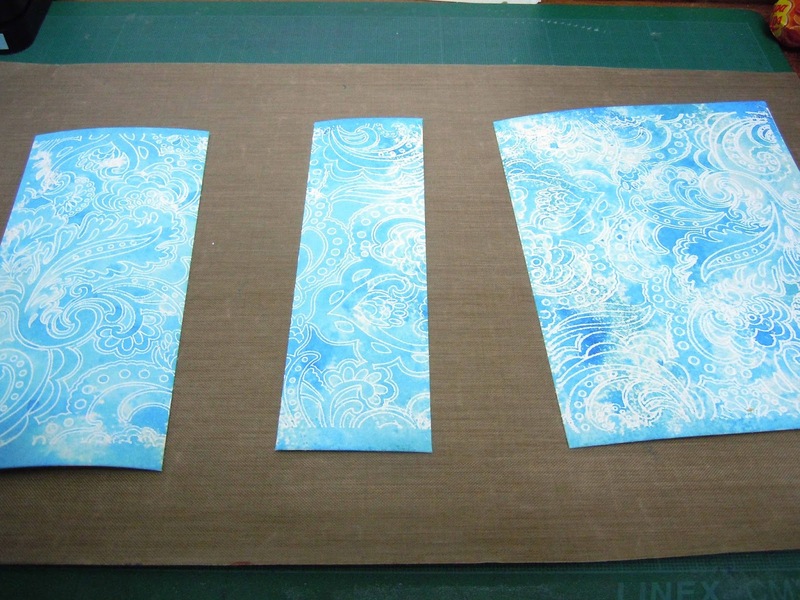 Dried it with my heat tool, then cut some panels ready for my cards. For the first card, I used the largest panel and used it as a background. 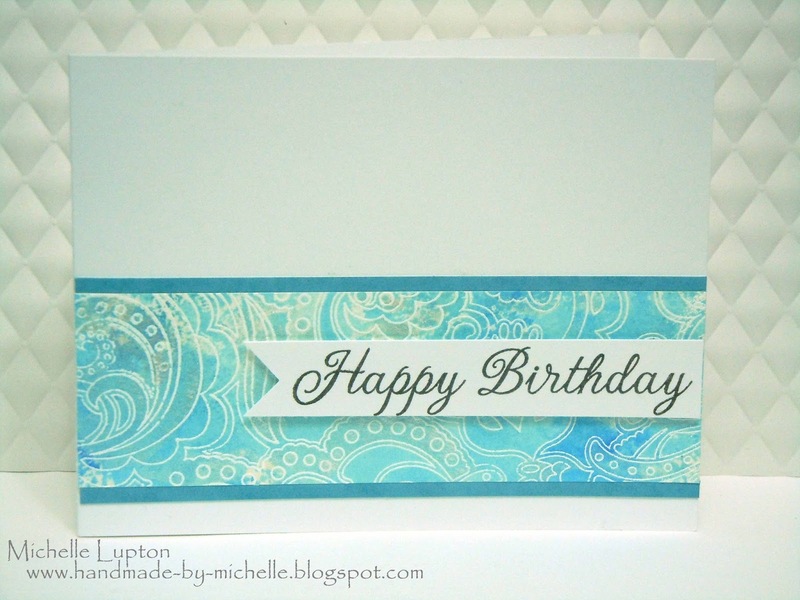 The sentiment banner looked a little lost by itself, so I swiped some white cardstock with Broken China Distress Ink and cut the borders for the top and bottom of the banner. I used the smallest panel for the 2nd card, and I added some Perfect Pearls to parts of the image. 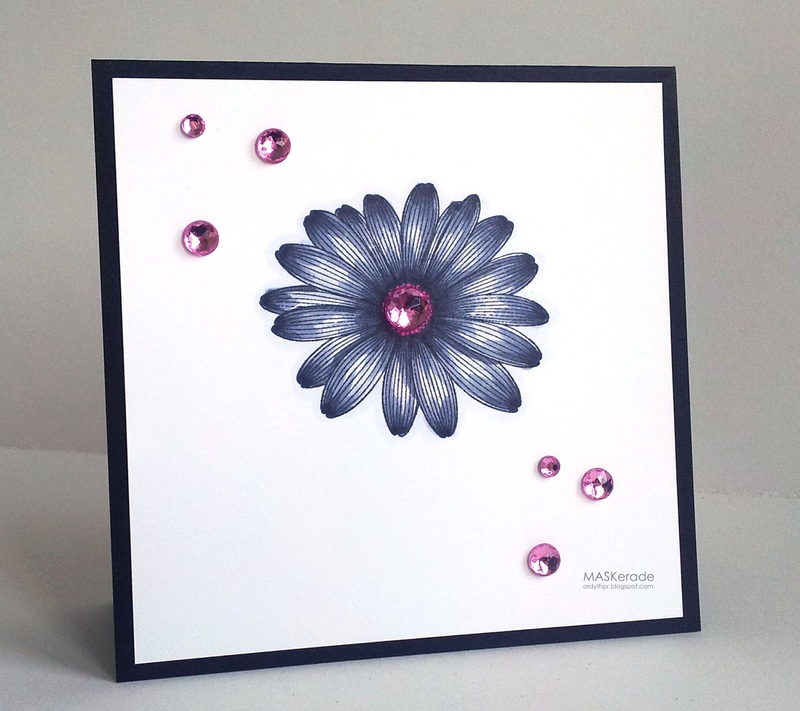 For the 3rd card (my personal favourite of the three), I fussy cut a portion of the background image, then I added some extra colour along with some Perfect Pearls Mists. Have you checked out our latest challenge? There’s still time!! There’s a voucher for Simon Says Stamp for one lucky winner! I’m Back . . . .with Flair! I’m sneaking in just before my official ABNH maternity leave is over to share two projects I made using some goodies from A Flair for Buttons! Anywho, I like to think the wheels on these cards are way prettier than mine was! I love the orange/teal combo for this truck card! I think it really sets off the flair while some glossy accents really make it shine. To make my bug a little more girlie I covered it in glitter and added a bow next to my flair. 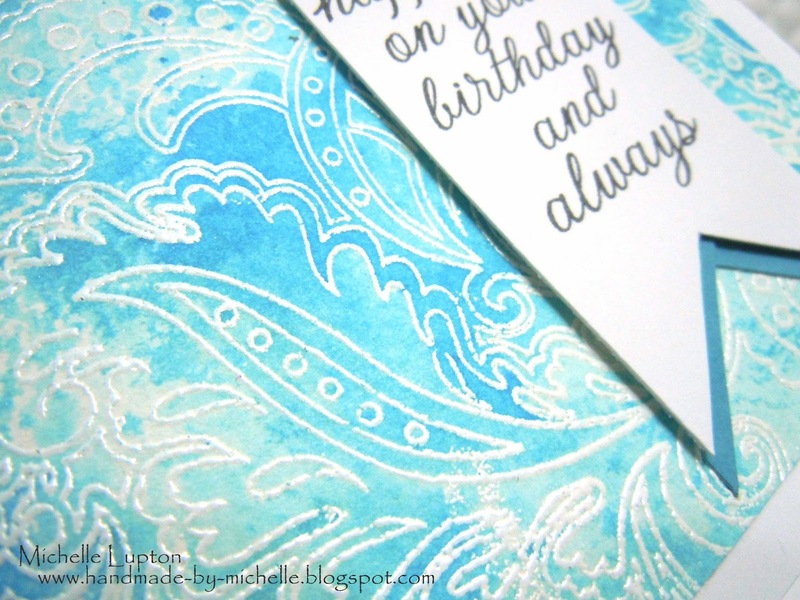 Today’s cards are made with a fun technique of making your own background text paper. I love combining sentiments and I love text papers. They are the perfect neutral background. Today I took a bunch of different stamp sets from Hero Arts (of course! ), that have the same font, and stamped away. I made a couple of retro ‘friend’ cards perfect to send our gal pals. Love the cute typewriter and phone! Aqua and olive green always mean retro to me. I really like the “typewriter” font for an old fashioned flair too. The first card was stamped with black ink…And the second card was stamped in brown ink… I couldn’t decide which one I liked better! This technique is cool and creative. You can be as wild or as mild as you want. For today’s cards I chose all the same font. This is also really fun when you combine colors and different font types. I just started stamping away! Then I finally got it the way I liked it…so I cut it! LOL. All that work, just to slice it into an oval… Cool though, right? I used one of the sentiments to stamp hi! on my typewriter paper too. I really Hope that you enjoyed this little project and idea – and hope you’ll give it a try! Design Team Opportunity! Love you guys! Ardyth here, bringing you a very shady post! I have always loved grey (don’t even ask how many grey sweaters I have in my closet!) and I’m thrilled that it’s so trendy these days. I’ve seen people colour their images with only shades of grey – if you have Copic markers, you’re in luck, because they make about a million different shades of grey and that makes it really easy to achieve some interesting shading effects. For my first two cards, I simply stamped an image in black ink and then shaded with Cool Grey tones. The results are moody and metallic and (in the case of the butterfly at least, a little Steampunk). I added some coloured bling for sparkle and contrast. For my third card, I used the Warm Grey shades, and added more colour. 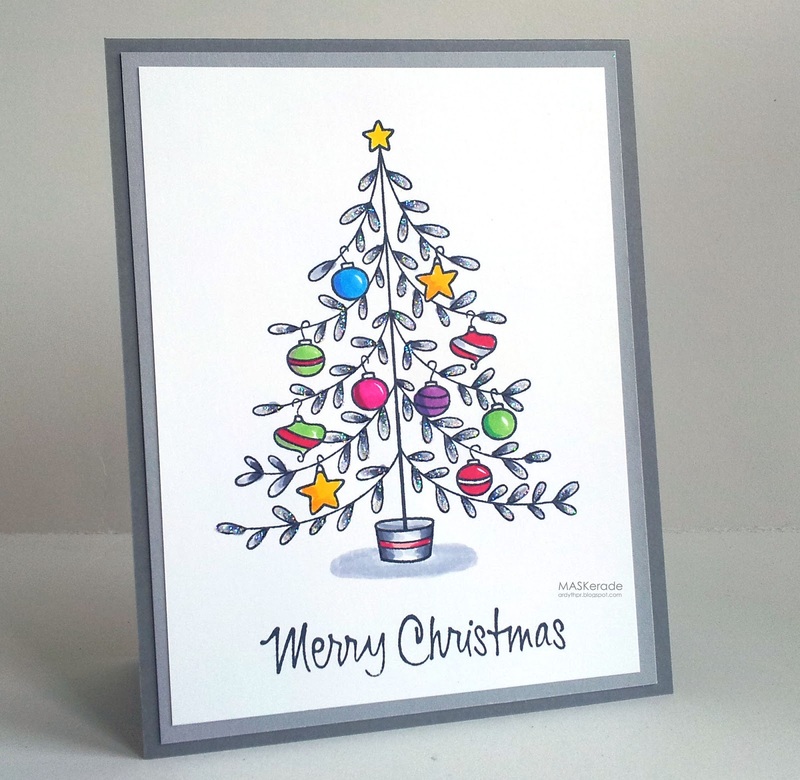 The result is a real emphasis on the fun ornaments and the tree itself definitely takes a bit of a back seat. It’s a different way to colour images and definitely gives a dramatic look – give it a try! Don’t forget about our current challenge Victorious Vellum, running until August 31 for a chance to win a $25 gift voucher from our sponsor Simon Says Stamp!